Three MBA candidates at the McCombs School of Business took home first place from the 2017 Fall Texas Venture Labs Investment Competition (TVLIC) at The University of Texas at Austin on Dec. 1, 2017, for their company SeatPotato. SeatPotato provides an in-seat delivery solution for concessionaires. Concessionaires and spectators at an entertainment event use the SeatPotato technology infrastructure to allow menu and merchandise orders to be delivered directly to a spectator’s seat. Team members include Brandon Schreiner, MBA ’18, Ankit Baid, MBA ’18, and Todd Morrissey, MBA ’18. In addition to taking home first place, SeatPotato received a cash prize of $10,000 and an opportunity to join TVL in New York City to close the Nasdaq. “Thank you to Rob Adams and Texas Venture Labs for providing a platform where we could share our idea and get really good feedback which will help us continue to grow,” said Todd Morrissey. The other four finalists include Wilder Systems in second place receiving $5,000, Tinted in third place receiving $2,000,Secure Logic in fourth place receiving $1,000, and Baby Button in fifth place receiving $1,000. In addition to awarding the top five teams, TVLIC also awards teams for specialized honors such as the Wells Fargo Clean Technology Award, the James D. Pippin Veteran Award, and the E. Craig Nemec Elevator Challenge Award. This year’s recipient of the Wells Fargo Clean Technology Award of $5,000 is Varuna. Varuna’s mission is to deliver a highly intelligent, self-managing grow environment to a set of American consumers that are currently at a loss for options. The company removes the barriers to entry for hydroponic gardening with a system designed to reduce time and education constraints. StockUp received the James D. Pippin Veteran Award of $1,000 given to the most promising startup in TVLIC with one or more veteran co-founders. The E. Craig Nemec Elevator Challenge Award goes to three teams that competed in TVLIC and gave the best elevator pitch for their business in two minutes. This year’s winners include Boreas Technologies, EmbraceBox, and Business Innovations for Good. Each team will receive $1,000. “SeatPotato winning the TVL Investment Competition is a great example of how intense and competitive the startup scene at UT Austin has become,” Beverly said. TVLIC is open to all graduate students at UT Austin seeking funding for new business ventures. This Fall’s TVLIC had 20 startup companies in attendance from various disciplines such as business, law, pharmacy, engineering, and psychology. The competition follows a shark-tank style format, where companies pitch their startups to a panel of experienced venture capital investors and entrepreneurs. Each team has 30 minutes to pitch to the judges. The winners of each semifinals division move on to compete in the finals to determine the Texas champion. In evaluating the student ventures, judges function as an investment group seeking to reach consensus on the business venture they would most likely fund. The Finals judges’ panel included Brad Bentz, ATX Seed Ventures; Shelley Hossenloop, poca international; Rod Keller, Odgers Berndtson; Art Olbert, IT and Business Consultant; and Nishi Viswanathan, Texas Health Catalyst. For more information on the teams selected to compete in 2017 TVLIC, visit the TVL website. Jon Brumley Texas Venture Labs (TVL) at The University of Texas at Austin is a campus-wide initiative to accelerate both student and community startups. Our mission is to help graduate students learn to take their innovations to market and become great entrepreneurs and business leaders. Since 2010, TVL has accelerated over 148 Austin-area startups in a wide range of industries and 42 percent of these companies have gone on to raise total funding in excess of $420 million. Over 450 graduate students from the McCombs School of Business, the School of Law, the Cockrell School of Engineering, the College of Natural Sciences, and the College of Pharmacy have earned experience working with these area startups. 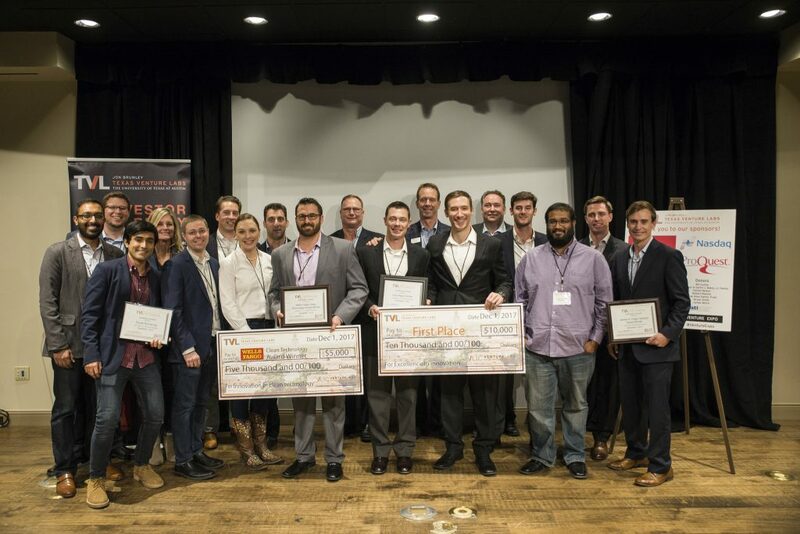 In addition, TVL has helped launch more than 80 graduate student companies through the Texas Venture Labs Investment Competition (TVLIC).